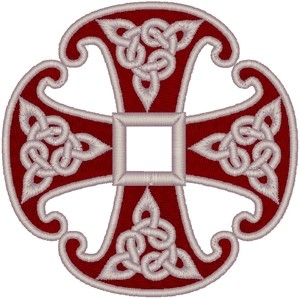 Canterbury Cross with Celtic Knots embroidered applique - Istok Church Supplies Corp. In 1867 a Saxon brooch dating from around 850 was found in Canterbury, England. It featured a small square in the center from which extended four arms that were wider on the outside, forming a triangular shape, a reference to the Holy Trinity. The Canterbury Cross was designed from that ancient brooch.